Having spent 22 Thanksgivings with my family, I've seen my fair share of crowded dinner tables, overstuffed tummies and packed fridges. This year will be no exception. As promised, the array of dishes that my mom and I made for Thursday's feast is so vast, turkey simply will not be missed. We planned a menu with something for everyone (and too much for any one person) to eat. Below, I've outlined every step of our process, complete with shopping lists, directions, and substitutions for those with allergies or dislikes. I hope this comes intime for your prep, and as always, I'd love any and all feedback on recipes, readability, etc. Happy shopping, cooking, and eating! Note: we made half a recipe, in a square pan; we’re guessing people will love this, but they’ll only take one helping. It’s pretty rich! Squash Stuffed With Red Quinoa, Pears and Cranberries Quinoa adapted from “Cranberry Pear Wild Rice Stuffing” by Nava Atlas, chutney adapted from this recipe in delicious living magazine Serves 8-12. Once the heat has been turned off, add the diced pears and cover the pot, allowing them to par-cook with the quinoa. Add the cranberries, onion/celery/thyme, pecans and apple juice to the cooked quinoa, and toss. If needed, add salt and pepper. Roast squash, upside down, in a pyrex with an inch of water in the bottom. For delicate, 30 minutes is plenty; butternut need about an hour. Remove squash from the oven when you can easily pierce their flesh with a fork. Fill the crevices of the squash with the red quinoa filling. Bring 1 ½ cups water to a boil and pour it over the apricots in a small bowl. Leave for ten minutes; this will reconstitute the apricots. Keep the liquid when done! Meanwhile, roast the jalapeno peppers under the broiler until the skin blackens and develops blisters, 10-15 minutes. (If you have a gas stove, you can char them over an open flame much more quickly.) Remove them from the oven and insert them into a brown paper bag. Allow them to steam in the bag for 5 minutes, then remove them and slide their skins off under running water. Chop them into a fine dice; they should total about 2 Tbsp. Into a pot on medium heat, add apricots, jalapeno, cranberries, crystallized ginger, spices and the leftover liquid from the apricots plus enough extra water to total 1 ¼ cups. Allow all of the ingredients to simmer until cranberries start to pop and the mixture gels, about 15 minutes. Remove from the heat, and allow the chutney to set. Top squash and quinoa with a dollop of the chutney, and serve some alongside as well. Alternative recipe: Add chickpeas to the quinoa, and mix in some salsa with the fruit chutney for a more savory topping. Rinse or wipe mushrooms clean, then pat dry; chop roughly into two or three pieces each. Save two or three mushrooms, which you can later chop and use as a garnish. Sauté shallots and garlic in olive oil until soft and translucent. Add mushrooms and sauté over medium-low heat until mushrooms start to emit liquid, about 10 minutes. Add half the broth, and allow to simmer for 15 minutes. 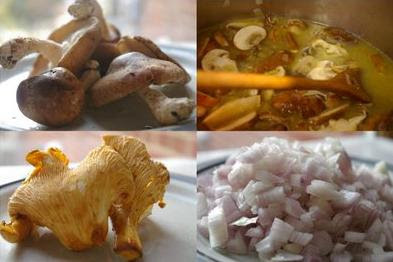 Remove mushrooms and shallot pieces with a slotted spoon and put into a food processor. Puree them with 1 cup of broth until smooth. Return to the pot, add the rest of the broth, and simmer 15 more minutes. Remove from heat. Serve warm, with mushroom garnish. If I'm forgetting anything, it's hard to tell. See why it's so hard to miss turkey with this thanksgiving feast?